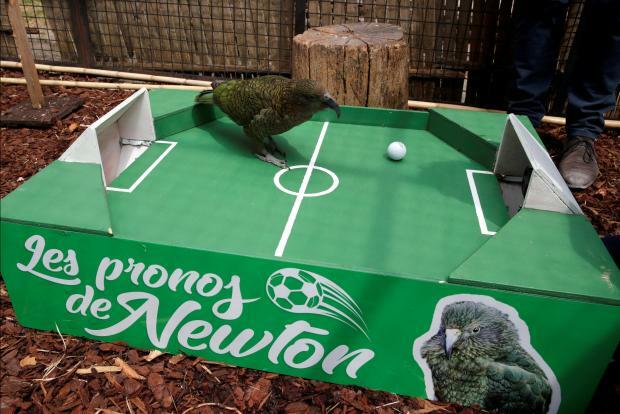 Newton the parrot, the latest prophet of the animal kingdom to give World Cup forecasts, reckons France will beat Uruguay in the first quarter-final of the 2018 World Cup. The dark-green feathered bird, which resides in Paris' Jardin des Plantes (Botanical Gardens), made his prophesy by flicking a small ball with his beak into one of two goals on a mini-soccer table. Newton's less-than-scientific prediction was broadcast on Eurosport TV. Besides Newton, other soccer sages from the animal world world have included a clairvoyant cat, Achilles, and hippos Milya and Glyasik, while the 2010 World Cup featured a series of correct forecasts from Paul the Octopus. France and Uruguay, both former world champions, play on Friday. France might, however, do well not to read too much into Newton's prediction after the parrot wrongly forecast Argentina would beat Les Bleus in the last 16, and that Colombia would conquer England.